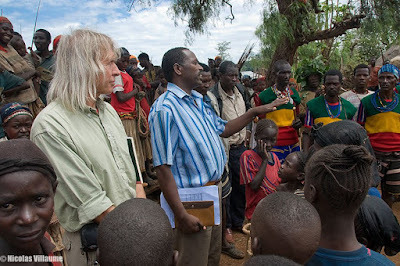 Following the plan made on Thursday 18 September 2008 to visit some Konso villages which are more remote and less affected by tourism than Gamole, the team visited the upland Goatcha and mid-highlands Faassha villages in Konso area. At Goacha, 20 elders and youngsters gathered in the moara (traditional public square) for a dialogue with the visiting LCS team. As are the local customs, only male representatives were present and spoke in strict order of seniority, eldest first. 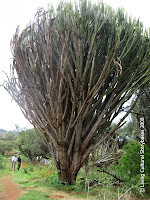 The community members expressed their appreciation of the LCS mission, and gave explanations for some of their culture- such as the “olahetta” (the generation tree), the “dhina” (traditional sacred forest of towering euphorbia trees(holaita), which are usually used for fire extinguishing and are esculent(edible), the “waka” (a traditional memorial standing stone for the deceased), and the names of successive generations. 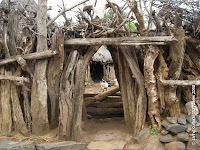 The dhinas are also used as communal toilets according to the elders. 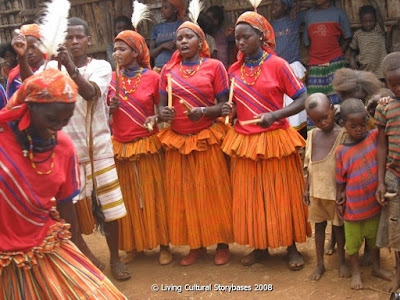 Gahama Dakaita said, "The culture is not going to disappear at once because we are here to protect it, but sometimes the children dom't participate because of their religion". (He was referring to an ambivalence towards the changes in view brought by Christianity, which we also heard from elders elsewhere. By tradition, the unmarried youth place their stick in a small thatched place in the moara to 'register' that they belong to the community.) They referred to Parka's work encouraging wall rebuilding and on re-forestation, as once the sacred forest was all round the village. This forest is protected by cultural taboos, for example only elders who have no other support are allowed to collect firewood in the sacred forest, the respect for the forest being passed from father to son in the culture. 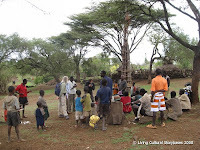 The elders emphasized the role of story telling in inter-generational cultural transmission(c.f. LCS) although added "But sometimes the kids don't listen". Another elder took up the importance of the men's house, where storytelling goes on through the night. (The LCS team noted that this night stay house would be a natural hub for LCS digital story-exchange work). On a question about education, the community felt it was not in conflict, because the school is nearby, so at least early schooling is embedded in the culture. 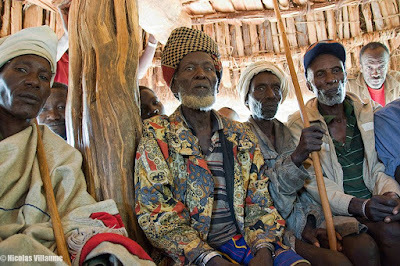 In Goatcha village, the alternating names given to generational peer groups bearing the community's responsibility are Hirba and Kalkusa , in line with the arrangement that the Konso communities from Karat area have two alternating names, thus making the generation period 18 years (compared with 9 years in Gamole). This area's unique stone-walled hill terraces which have been handed down from generation to generation are another strong example of the close link between culture and sustainability of the environment and agriculture. The elders explained that not a single stone can be removed. There is a heavy obligation on each family head to build and maintain the terrace walls. If this is not done, there are traditional punishments via the village court, because not only does the family loose its livelihood, but the whole community and the legacy they leave to the next generation can suffer through soil erosion of the hillside. 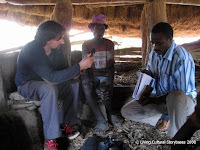 We were taken to visit the dhina of the Goatcha village, the moara forest, the stone wakas, the generation tree, and had a chance to talk with some Knoso weavers in the village and record a sample story a young man told. 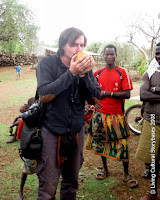 Finally, we shared a traditionally-blessed drink from a gourd before leaving this friendly village where we had learnt much from the elders. Following this, we traveled on to the Faassha village which is a large Knoso community of about 8000 in the Kera area. There we met 39 male community elders in this village’s youth night stay house. We were given skins to sit on in the stone walls which form a circle of the sunken lower room, each participant having a place based on their community position, the elders bearing staves marking their status and speaking in order of seniority. (As the elder LCS visitor, Paul was expected to speak before Nico.) During our quite formal meeting, we were briefed that this village as a Kera area Konso community has 3 alternating names for generational groups bearing the community's responsibilities. The names are Hirba, Kalkusa and Melkusa. Each name would be given to the generation designated to be responsible for 9 years. Thus, the generation period in this community is 9 years. 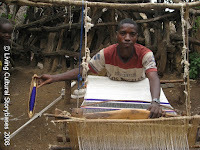 The planting and harvesting seasons are marked by a sacrice of a goat or sheep. Every annual major harvest, the head of a sorghum plant would be cut off and kept in a special place in order to count passing of the generation-period years. 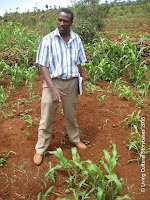 When the number of the sorghum head reaches 9, a whole new generation groupo is assigned all the community responsibilities, with the next of the 3 alternating names. The generation group leader always comes from one of three families locally known as Ermale, Taytemo and Mussha. Once again a tension between old unchanging traditions and new 'religion' was voiced. 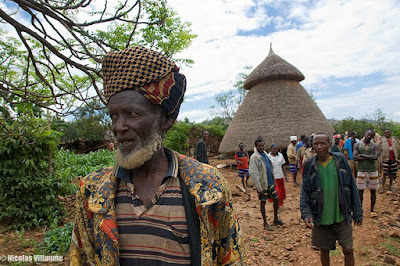 These male elders have a very clear pride in their cultural identity. The community elders spoke led by Tarefe Korano, saying they have a strong culture now, despite its oppression by the Derg Regime which burnt the village and the old youth-stay house. The new house was built 2 years earlier with TCF and Parka support, but they still ask for further outside assistance. Again, the importance of story-telling came up. "There is no paper to write, but everyone should be a child to hear the story and stay by me to hear stories at night." The two places for learning were said as learning in the family and learning in the men's house. One elder, speaking of his peer group said "We are the future resources for the others... I don't know when I die, but you'll have to take over the responsibility then." The second and third elders to speak both said "Thank you TCF, we are lucky to be a part of the Parka programme". The Parka organisation has been embraced by these communities and played a strong role in preserving the unique cultures and thus the landscape and agriculture of this region of terraced farming and stone-walled hill villages.Our Parka guide showed us some of the replantation work and a series of three photos taken at the same place, showing the landscape regeneration they have achieved with the community. 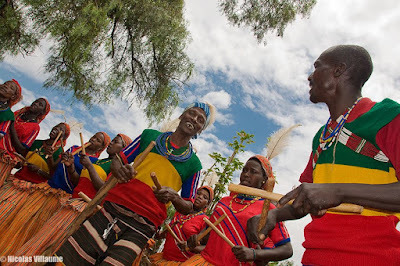 Before we left Faassha, the Parka Traditional Music Unit enthusiastically presented colourful Konso traditional music and dance for the visitors. They also sang explicitly of Parka’s efforts and their gratitude. The strong communal feeling, hospitality and friendliness of Faassha was very obvious. You can sample two of their dance songs by activating the play buttons below.